What other countries used pounds, shillings and pence? Australia used pounds, shillings and pence until 1966. But Australian and New Zealand pounds did not have the same value as UK pounds. 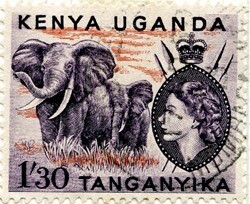 Kenya, Uganda and Tanganyika stamp with the strange value of 1/30. It was worth 1 shilling and 30 cents (not pence), 1 shilling and 4 pence in UK money. Some former British colonies used the East African shilling. One East African shilling had the same value as a UK shilling and there were 20 East African shillings to a UK pound. But the East African shilling was divided into 100 cents. It says something about how poor people were in East Africa that a coin worth 100th of a shilling made sense. One cent was 0.12 of an old penny or less than half a farthing. Several East African countries kept this currency after independence. They issued new shillings and cents. In 1966 both Kenya and Uganda issued new shilling coins divided into 100 cents. Tanzania issued the shilingi divided into 100 senti also in 1966. In all three countries the shilling was the main unit of currency, there was no equivalent of the pound.